Beacon commercial real estate continues to change hands, with the latest deal being the sale of The Beacon Theater. The property is currently “owned” by 4th Wall Productions theater company, with the mortgage held by Manhattan real estate speculator William Erlich, a hoarder of properties and a doer of nothing. The buyer is Robert McAlpine, who purchased and developed the Roundhouse and associated buildings from Erlich in 2010. Although there is yet no official word, it also appears that a long-brewing deal between McAlpine and the City of Beacon for a parcel owned by McAlpine on the east side of Churchill Street is set to close shortly. Back hoe activity has been observed on the site for some time, and it is no secret the city would like to build a municipal parking lot there. Parked cars will have a coveted view of the Fishkill Creek from this location. It appears the city has backed down from the initial plans for up to 100 spaces, and there is talk of a “pocket park,” an elusive species of public space called for in the Comprehensive Plan but so far nowhere to be seen. Contiguous to the municipal lot, there would also be additional parking for the proposed brewery, as well as any development happening at 1 East Main Street. The municipal lot would be across the street from the 9-11 Creek Drive project, which is currently slated for 95 parking spaces. If the city sells off the current site of the highway garage to this developer, that figure could potentially go up. Not to worry, however, as all the associated environmental assessments and traffic studies tell us there will be no significant changes to the character of the neighborhood. In other development news, no fewer than four major development projects, each in various stages, appeared before the planning board on Tuesday, July 14. The total number of “units” represented by these projects is well over 200. More details on these beginning next week. I don’t think exact plans have been drawn up but yes, it is my understanding that most of the original theater space will no longer be theater space at some point, with a smaller section in the front of the building to be preserved as a performance space. However, I believe the theater company and the developer will be announcing plans later this week. Mark – you raise a great question. 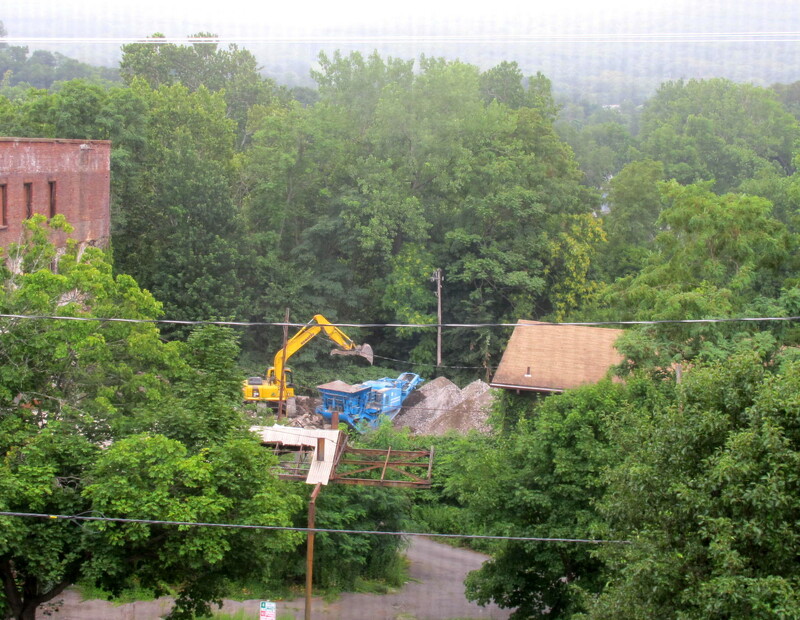 What exactly is the city’s intention regarding the Churchill Street property along Fishkill Creek? Since this purchase would obviously be made with public money, don’t they have some obligation to the public to say how much they are spending and for what? Additionally, putting parking lots in those two hilly locations, is an appalling prospect. Anyone who has ever tried to get into Main Street from Churchill Street knows all too well what a dangerous intersection it is NOW! I believe the city already has money set aside for building municipal parking. In the case of Churchill Street, if I remember correctly, the city has a one million dollar bond out. What I find most troublesome is the talk of a “walkable, bikeable city” on the one hand (which has been shown in study after study to greatly boost local economies), while on the other hand we continue to invite more and more automobiles into the city. Instead of paving over the few remaining bits of earth in order to park cars on, we should overhaul and simplify the comprehensive plan, and look at ways to actively reduce cars and car trips in the city. Faced with choking traffic and pollution, many larger cities are already desperately working on this, including London, Paris, New York. Next week, we’ll look at ways a tiny city like Beacon might begin to tackle the situation. My husband and I so agree. What this will do to our quiet neighborhood next to Fishkill Creek is heartbreaking, in terms of noise and traffic and air quality. AND, really more importantly, what this will do to the CREEK is so worrisome. When we read up on what happens when parking lots are built next to bodies of water, everything we learn horrifies us. Trash, oil runoff, toxic gas fumes – it all goes right into the Creek. This is a really sad turn of events for Beacon and it doesn’t feel like progress to us. Hey Mark, it’s all good. It’s actually something we at 4th Wall have been working on for months and we will unvail it in the next couple weeks. Yes, there is mixed use, yes, there is expanded programming for the theatre company and major improvements to the theatre, and yes, we are very excited about it! Give us some breathing room and we will unveil our plans ASAP. Thanks as always. Hi Pat, thank you! We look forward to hearing plans and are glad to hear the theater company is expanding. Wigwam is pro local entertainment! If this post came across as somewhat jaded, our apologies, we meant no foul. Lots of stuff going on and we’ll be looking at all of it in the coming months, from different perspectives. Also it should be obvious that the let’s do it approach of the McAlpines (both Bob as well as his son Brendan, who is the McAlpine buying the theater) is generally preferred over the stockpiling of a speculator like Erlich, even if one doesn’t agree with the ultimate outcome of a particular development. Certainly their Roundhouse project has been a driving force behind Beacon’s current upswing.